[New for 2014] I've got a leg cramp that won't go away, it's not too sunny, and there's a refreshing breeze.... sounds like a good day to walk to 7-11 right? "The refreshing taste of Sprite with natural cherry and orange flavors"
Now I didn't remember the description of 6 Mix when I went to buy this drink so it was time for me to play the flavor identification game. I took a sip and I got that it was supposed to be Sprite, but I got another flavor more. The problem is, I really couldn't put my finger on it. I drank the whole thing on the walk back to work and I just couldn't place the flavor combo. It was familiar, but I just couldn't describe it. It was almost tropical in nature. Reading the description now as I write this quick review, I'm still kind of going "wait, it was orange and cherry flavored?" 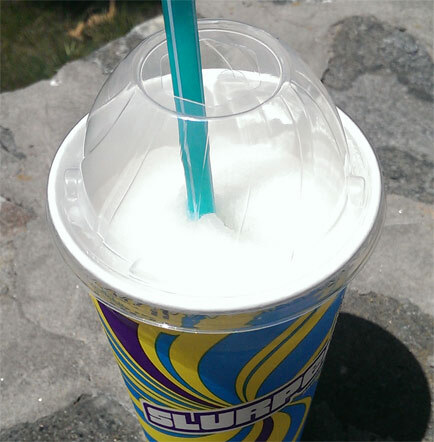 Is this a bad slurpee? Nah, I've had worse, but I wasn't mesmerized either. It's not a horrible combo, but there is still a strangeness to it. Way back during Episode 26 of the Nosh Show, we debated if we would sip or spit the new Sprite 6 Mix (canned version, not the slurpee). I said sip at the time, but to sum up my review, this has pretty much dissolved any ambition I had to try the canned version. Extras: If you are interested, there is an instagram #6MIXCONTEST going on through the end of June, you can click here for more details.